It’s getting to the point where I constantly have to be online between e-mail, instant messages, blogging, Webinars, document collaboration, shared calendars and news ingestion. I don’t consider myself an online junkie (although denial is the first sign), it’s just that the entire workflow around my career now requires an online connection. The problem is that I’m rarely stuck in a static office since I’m visiting clients and traveling to various projects. It’s certainly possible to get online via a Wi-Fi hotspot but I’m always leery of security issues on open networks and weary of having to obtain passwords for secure networks. I much prefer to manufacture my own safe, secure, and reliable wireless Internet connection anytime and anyplace. The secret sauce behind my wireless freedom is high-speed data access over 3G cellular networks (often called mobile broadband). You’ve probably seen commercials for services from AT&T/Cingular, Sprint and Verizon. After trying out several, I’m partial to Verizon because of their network availability, speed, and signal strength. The Verizon Wireless network obviously handles voice calls, but it also supports data. The fastest technology used for data transmission over cellular networks is “Evolution Data Optimized,” commonly abbreviated EV-DO (AT&T uses the competing EDGE and HSDPA technologies). This is also known as a 3G network which loosely indicates that it incorporates “third generation” technology. And to make it even more confusing, Verizon used to re-brand the technology with the consumer-friendly name of “BroadbandAccess,” although it appears that they are now moving away from that distinction (the slower 2G or 2.5G network, akin to dial-up speeds, was called “NationalAccess” by Verizon). Surfing the Net on Verizon’s 3G data network is a lot like surfing on a Wi-Fi hotspot, or even your home/office broadband Internet connection. As long as you have a good signal on the Verizon network, you’ll experience reasonably fast connection speeds. The biggest difference, of course, is that you can now surf wherever you get a Verizon signal, which can be in the park, in a moving car (while someone else drives), or a coffee shop. I am no longer tethered to a desk for my Internet fix. There are a few ways to access Verizon’s 3G data network. Many cell phones today can surf the Web themselves. If you have BlackBerry or a Palm Treo, for example, they have built-in Web browsers that allow you to surf and view Websites. If your phone is compatible, you can “tether” it to your laptop and use the cell phone as a wireless modem to surf the Internet. Verizon calls this their “Mobile Broadband Connect” service and you’ll pay a little more for the convenience. Next, a good number of laptops on the market today have 3G wireless network cards built-in, just like they have built-in Wi-Fi. These cards, however, are tied to a specific network provider (e.g. Sprint/Nextel, AT&T/Cingular, etc.) and cannot jump to a different network. For my needs, I have found an external wireless broadband modem to be the most flexible and useful, although it is yet another device to carry around. When I first started using 3G data networks, the only choice was PCMCIA cards. Those worked fine, but obviously only fit into laptops that sported a PC card slot. You’ll find that many computers today (especially the tiny netbooks) don’t even offer a PCMCIA slot since the technology is considered outdated. So you can imagine my excitement a couple of years ago when the first USB wireless modem was announced. Finally, this meant that I could use the wireless modem on any computer – desktop or laptop – without the requirement of a bulky PC card slot. I was first in line to get the Verizon USB720 wireless modem when it came out. That modem served me well (I reviewed it for LLRX.com here), until the USB760 was late last year announced. The Verizon Wireless USB760 modem is amazingly small for what it holds. It really is no bigger than a typical USB flash drive but yet it holds a full wireless modem, as well as a tiny, microSD removable memory slot. There are no external antennas to snag on clothes, and it weighs under an ounce. As you can imagine, I am enamored with the USB760 and it lives in my pocket when it’s not plugged into my laptop. I was skeptical that something so small could really pull down a reliable signal, but after a few months of testing, I’ve never had a problem, and in some cases, it connects better than my old USB720 and the much older PCMCIA cards that I used to use. Another fantastic feature with the USB760 is that it actually has the VZAccess Manager software loaded on to the device, negating the need to carry around a software CD. I used to work at a law firm and every time that one of the attorneys needed to take a Verizon card with them, I had to set up a time prior to them leaving so that the software could be installed. I usually had to send the CD with them in case the software needed to be re-installed. But with the USB760, the software is already on the device and launches automatically when plugged in (compatible with both Windows and Mac). All of this wireless goodness comes with a price, of course. The USB760 retails for $149, although you can get it down to $99 or even $49 depending on the data plan that you purchase. Then you have to pay the monthly data connection charge, which is over and above your monthly voice minutes. Pricing can vary if you pair the data plan with a voice plan, but expect to pay $50 to $60 more a month for access (Verizon used to offer an unlimited plan, but they now appear to enforce a 5GB limit). Now, that’s a lot of money every month, but it can certainly be justified. As I stated above, I need to be online more than ever before, and I can’t afford to waste time looking for a Wi-Fi hotspot – I need reliable, secure access everywhere. Verizon’s 3G data network is much more secure than public Wi-Fi hotspots, and I know that the signal is going to be reliable. I’m no globetrotter, but I do find myself staying in a hotel room 3-5 nights a month. I could pay the $10-$12 a night for wireless access from the hotels while I’m there, but then I’m already up to $50 a month (David Pogue ponders “why is Wi-Fi free at cheap hotels, but $14 a night at expensive ones?). Plus hotel wireless is routinely horrible. And lastly, it’s worth the cost for me to be connected anywhere – riding on the bus, in the car while my wife drives, sitting at the park while my daughter plays, or giving a presentation in a conference room without having the client to jump through hoops to get me connected to their network. The Verizon Wireless USB760 modem may not be the right device for everyone, but it has become indispensable for me. If you have a 3G modem like the Verizon Wireless USB760, the CradlePoint CTR500 is the perfect complement to increase the wireless functionality. By now, we’re all familiar with a router because we’ve visited the local Best Buy and bought a black-and-blue Linksys wireless router for our home network. That kind of router takes the Internet connection coming into your home (via cable or DSL) and pumps it out wirelessly to the entire home. 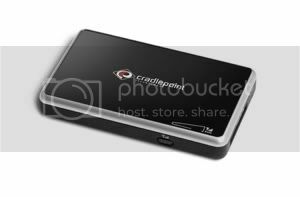 The CradlePoint CTR500 does the same task, but instead of getting the Internet connection from a wired cable or DSL connection, it uses a USB or ExpressCard 3G cellular modem to create its own wireless hotspot. While the Verizon Wireless USB760 can only connect to one computer at a time, the CradlePoint CTR500 allows the signal to be used by many computers. I admit that I wasn’t too familiar with the CradlePoint company, but I am very impressed with their array of mobile broadband routers I chose the CTR500 because it had the best balance of portability and functionality. It measures 4.8″ x 2.8″ x 0.8″ and weighs around 4 oz – it’s about the size of an iPhone and obviously doesn’t add much bulk to my briefcase. It only accepts USB and ExpressCard 3G cellular modems, so if you have an older PCMCIA modem, you’re out of luck. The CTR500 supports the latest wireless security protocols, and features a full firewall package on par with other consumer-based wireless routers. The first time you turn on the CTR500, you’ll be invited to walk through the “Set Up Wizard” which makes the whole process painless of setting up an admin password and security options. I found it easy to tweak settings through the browser interface. The panel of LED lights on the front of the CTR500 indicate whether you have a signal, and if traffic is getting through. I also appreciated the on/off switch that allows you to shut down the wireless connection without un-plugging the cellular modem. Connecting to the CTR500 with my laptop was as easy as finding a wireless hotspot. It found the name that I had assigned to the router and jumped on immediately. To my laptop, it had no idea that this wireless hotspot was based on a signal from a 3G cellular modem – the CTR500 makes the signal look just like any other wireless hotspot. CradlePoint also incorporates some technology they call WiPipe into their routers. There isn’t a whole lot of detail about how this works, but it appears to knead the wireless signal to get the best possible traffic. I don’t have any scientific data to back this up, but I felt that my connection through the CradlePoint CTR500 was sometimes better than when I used the Verizon USB760 on its own. Whatever magic CradlePoint has infused into WiPipe appears to work just dandy. The CradlePoint CTR500 is supremely helpful in several scenarios. This can be a perfect way to set up an ad hoc wireless network for 2 or 3 people that are “on the road.” If a client team of 3 attorneys are traveling to make a pitch to a client, they can use the CradlePoint CTR500 paired up with the Verizon Wireless USB760 in their meeting room, so that all three folks have wireless access to check e-mail and get their work done. Their tech support folks won’t have to worry about calling ahead to find out what Internet access is available, or worry about securing their machines before they leave. The CradlePoint CTR500 is perfect for a trial “war room” – the whole group can use the router to access the Internet as they prepare for the big day. I even used the CTR500 at the hospital for my wife and I when we had our last baby. I followed all the rules about electronics in the room, but it was a great way to connect with friends and family without having them travel. I am now a big fan of CradlePoint routers. They have a terrific niche that I predict will become even more important in the next few years. It is clear that the security, reliability and speed of 3G data networks are starting to overtake the limitations of traditional wireless hotspots (limited area, security issues, etc.). There will always be a place for these traditional wireless hotspots, of course, but 3G networks provide so much more for travelers and those that need reliable Internet access everywhere. And while a 3G modem is great on its own, the CradlePoint routers like the CTR500 just enhance their usefulness.